Just a small part of the infographic showing the bracket. Again, League gives back to those with an analytical mindset. Riot released an infographic to the @lolesports Twitter on the 14th of August displaying information about the 2018 Spring Promotion Tournament that took place shortly before. The graphic shows the bracket, the amount of each type of dragon taken during the games, the most picked and banned champions, the highest winrate champions, the “players of the week”, and some interesting facts about the tournament’s history. In the tournament, current LCS teams Phoenix1 and Team Liquid retained their spots in the LCS. This is Liquid’s second promotion tournament in a row. The dragon most taken was infernal, which makes sense because it’s arguably the most useful dragon to a team. The most picked champions were two ADCs and one support, being Tristana, Varus and Braum. The most banned champions also had two ADCs, in the form of Caitlyn and Kalista. Maokai was the third most banned. The highest winrates in the tournament were on Thresh and Taliyah, with an 85.7% and 80% winrate respectively. The 6 statistics featured on the “players of the week” section consisted of highest KDA, most kills and deaths, most wards per minute, highest kill participation, and most assists. Liquid’s mid laner Mickey took the highest KDA award. Phoenix1’s mid laner Ryu took the most kills. eUnited’s jungler DanDy took the most deaths “award”. Most wards/minute went to EUN support Zeyzal, highest kill participation went to Gold Coin United’s Madlife and most assists went to Phoenix1’s support Xpecial. The 4 interesting facts are mainly about the history of the tournament. The one fact not about the tournament’s history involves pentakills. 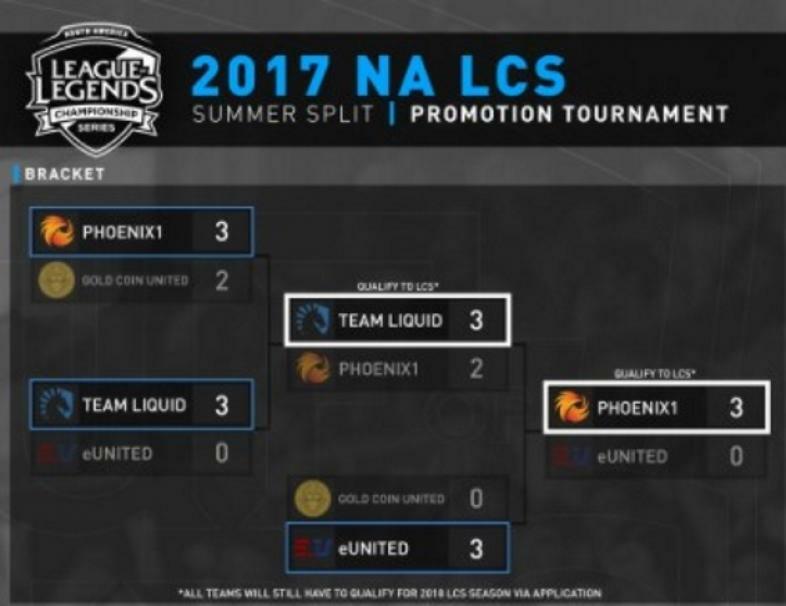 The Phoenix1 vs Gold Coin United series had as many pentakills as the entirety of the 2017 NA LCS Summer Split. Dignitas has been in the promotion tournament three times. Team Coast has been relegated to the NACS twice and requalified for two promotion tournaments afterwards. The team was later purchased by NRG. There were 5 players in the tournament that would be considered rookies by the LCS. Overall, this infographic is a good way to sum up the tournament.